I have a thing for burlap. Anyway, I went to Hobby Lobby a few weeks ago and burlap by the yard was half off, so I bought three yards. It cost me less than $5. I also bought three yards of off-white linen, for $3. And I knew exactly what I wanted to do with it. I saw this pin of a burlap and linen tree skirt and I really wanted to make it. If you want to see the tutorial I found via pinterest, it's here. The thing is, I don't have a lot of patience. For that reason, I am not a great crafter. So I did my skirt a little differently and probably a lot quicker. *Note - I glued mine onto my old tree skirt which was made of felt, without any problems. First, cut your burlap and linen into 4-5 inch strips, all the way down the three yards. Next, and this is different, I didn't pin anything. Not even the burlap, which is quite a bit harder to work with than the linen. I folded, put a line of glue, pushed down on it with a folded over paper towel - which prevents you from being burned - and then put a dot of glue to hold the ruffle. With the linen, you don't need that extra dot because the linen will hold the ruffle pattern much more easily. I finished up in about two hours. The only problem was that I had burlap left over. So what's a girl to do? 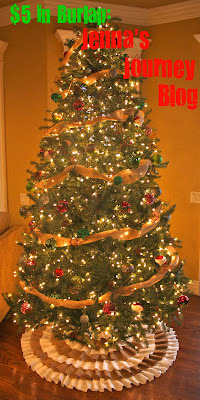 Cut more strips, and use it as garland on the tree of course! And that, my friends, is what $5 in burlap can do for you!